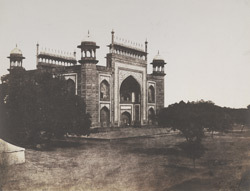 Photograph of the entrance to the Taj Mahal in Agra, from the Murray Collection: 'Photographic views in Agra and its vicinity', taken by John Murray in the mid-1850s. The Taj Mahal is the finest building from the Mughal period and one of the most famous monuments in the world. It was built by Shah Jahan (r.1628-58) as a memorial to his favourite wife Arjumand Banu Begum, also known by her titles Mumtaz Mahal (Chosen of the Palace) and Taj Mahal (Crown of the Palace). Work on the tomb began in 1631 and by 1643 the entire complex was almost complete. The main entrance, the Great Gateway was built in 1648. It is faced with red sandstone and inscribed with passages from the Qur'an with twenty-six marble chatris, or domed kiosks on its roof. The complex is perfectly balanced and the tomb itself has superb proportions. The tomb was constructed using the finest marble in India from Makrana near Jodhpur, which appears to change colour depending on the light and the time of day. It sits by the banks of the Yamuna river on a high marble plinth at the southern end of the garden. Floral pietra dura designs embellish the exterior and interior of the building. These are made from semi-precious stones from all over India, China, Persia, Yemen and Russia.